So many things about The Joker, Harley Quinn, and Deadshot have been flooding the internet lately that one member of Task Force-X hasn’t been receiving a lot of coverage. 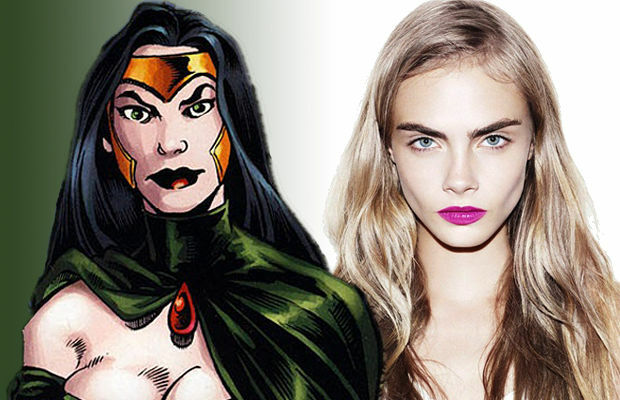 Nothing much has been said about Cara Delevingne’s portrayal of Enchantress. The only thing we do know is what she will look like at one point in the film. Aside from the first full cast photo, Delevingne has been absent from most of the social media attention. Recently Delevingne spoke to EW about her film Paper Towns. During the interview the model turned actress had some enlightening things to say about the upcoming David Ayer picture. If you’ve kept up with my articles you already know how excited I am for this movie to come out. After this little tidbit from Enchantress herself how else could you feel? If Ayer can pull this one off I think that the rest of the DC line-up will come a little easier. Cara Delevingne will be teaming up with an all-star cast of actors and actresses for this gritty DC film adaptation. She will be joined by, like you don’t already know, Will Smith (Deadshot), Jared Leto (Joker), Margot Robbie (Harley Quinn), Jai Courtney (Captain Boomerang), Joel Kinnaman (Rick Flagg), Viola Davis (Amanda Waller), Adewale Akinnuoye-Agbaje (Killer Croc), and so many more. Aside from the already beefed up cast be prepared for a few surprised along the way. I have my fingers crossed for The Terminator himself, Slade Wilson.